A racing frame with pioneering Actiflex technology to soak up rear vibrations. Add the stopping power of disc brakes on top of a Shimano Dura Ace groupset and you can take the road less travelled with supreme confidence. The Wilier Cento10NDR Road Bike caters for those who want a comfortable geometry with a quality performance, this superb lightweight carbon road bike features pioneering Dual Brake technology that lets you choose between disc brakes and direct-mount calipers. Used with the flawless Shimano Dura Ace R9120 disc-specific drivetrain, including Dura Ace 9100 flat mount brakes with 160mm rotors, a high-end DT Swiss wheelset, and quality FSA and Selle Italia finishing kit, offers a complete versatile package. The injection of a proprietary viscoelastic film between layers of carbon increases vibration absorption and impact resistance, therefore making the frame safer and more comfortable. This new material has already been widely tested in the aeronautical and automotive industries with excellent results. It is now being applied in the construction of bicycles for the first time. The heart of the Cento10NDR frame, providing an all-new connection between the seatpost and seatstays. Using a carefully designed aluminium link and technopolymer dissipater allows Wilier to give the rear wheel a few millimetres of travel. The torsional stiffness of the aluminium link remains comparable to traditional monocoque carbon seatstays, despite the various connections involved. This stiffness gives the frame racing performance but at the same time allows the rear wheel to move up and down over bumps caused by imperfections in the road surface. Connected to the link there is a dissipater that stabilises the kinematic movement of the rear triangle. This special technopolymer has amazing mechanical properties, high atmospheric resistance and can function in temperatures from -40°C to +150°C. The sophisticated design of the steerer tube combined with the special form of the headtube allows us to thread up to three cables inside the frame. The three cables enter the steerer tube through the Alabarda or Stemma & Barra, routing the gear and brake cables from the levers at exactly the right angle in the steering tube. So, if you’re using electronic gears and disc braking, the bike will not have any exposed cables, giving the Cento10NDR a beautifully clean look. Aerodynamic: Cento10NDR is a race-ready frame derived from the Cento10AIR, our high-end light, aerodynamic bike. As in the Cento10AIR, Wilier’s new creation has been developed according to Naca-Low-Speed rules – aeronautical algorithms that allow us to design the frame tubes with the highest possible aerodynamic efficiency. Alongside the NACA algorithms, Wilier uses another important concept in aerodynamics: the Kamm theory. Indeed, all profiles are designed with a K-tail, reducing weight and increasing stiffness without negatively affecting the aerodynamic efficiency of the tube itself. Cento10NDR is the first road bike whose frame and fork can be fitted with two different types of brakes: disc brakes with thru-axles and 160mm rotors or traditional direct-mount caliper brakes with QR skewers. This solution expands the available configurations of the Cento10NDR, meaning the frame is always ready for an upgraded braking system. The fork and rear triangle have been designed to accommodate a wide range of tyres: up to 28mm with the direct-mount setup or up to 30mm if using disc brakes. Balanced Design: Balanced design means the ride feels the same on all Cento10NDR frame sizes. The tube sections in the various sizes are different, to make sure that stiffness, comfort and ride quality are the same on each frame size produced. 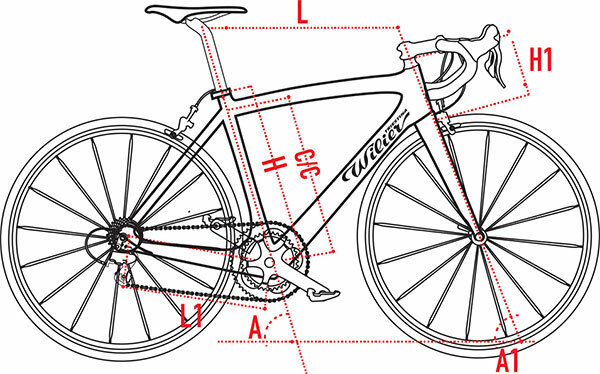 Frame geometry is key when it comes to endurance bikes. To offer Cento10NDR riders the maximum level of racing comfort, the proportions between the frame tubes needed to be rethought. The final result is a position that is slightly shorter and taller than in traditional racing geometries, thanks to a shorter reach and a greater stack. This reach and stack combination gives a more comfortable position without using any spacers between the stem and the frame. How often do we see cyclists with pure racing bikes and several centimetres of spacers on the steerer tube? Now with the Cento10NDR the overall look of the bike will be harmonious, proportionate, balanced and at the same time race-ready. Each bike is fully built, tested and tuned by Wiggle's team of qualified bike mechanics to ensure your bike arrives in perfect condition. To find out which size fits you click on the size guide tab above. Note: Manufacturer may reserve the right to change the specification of that listed or shown on this page.